So my friend Lindsey gave me a bunch of tomatoes that have spent a lonely week on my counter. Today I decided to do something about it, so I perused my cookbooks and found a simple roasted tomato sauce in “The Best of the Best” by Food and Wine magazine. I adapted it to what I had lying around and am very pleased by the results. Basically, you stick your your tomatoes (the recipe calls for 3 lbs. I used as many as would fit on my toaster oven pan, adding two cooked chicken sausages I found in the meat drawer.) under the broiler with a drizzle of olive oil until the tomatoes are cracked open, hot, and even blackened a bit. Meanwhile, cook a pound of pasta. 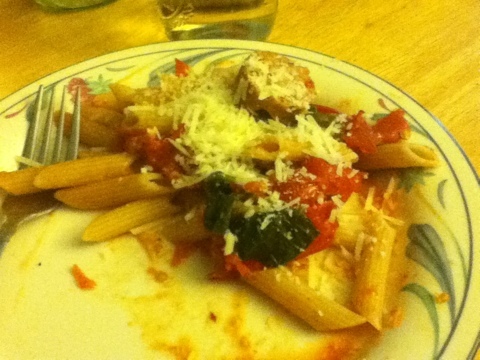 I had penne, the recipe called for orrechiete. When the tomatoes are done, smash them in a bowl with a ton of fresh basil (i used about 40 leaves), the chicken sausage, and a spoonful of chopped garlic (I used the jar kind). The hot tomatoes will wilt the basil. Stir in the pasta and serve with a sprinkling of parmesan cheese. I do think I added about a teaspoon of salt and a couple cranks of pepper to the sauce. It was very yummy. You should serve it with garlic bread. I served it with bagel thins, because that’s how I roll. And that’s what I could find on the counter.